Apologies for the poor photos but I just cannot seem to get the lighting right. More experimentation needed. The yellow of the coats is a more yellow-buff colour in real lighting conditions and they are not quite so glossy. I think that these and the Saxon Zastrow Cuirassier figures were the best of the Napoleonic sculpts that Peter Gilder did for his Connoisseur range. These are still available from Andrew Barret at Bicorne Miniatures. They have an animation that modern figures seem to lack. The detail is a bit more sketchy and you have to take the odd guess as to what exactly has been molded but all in all, I think they stand up pretty well for models designed in the 80s. These are based on 40x50mm bases. 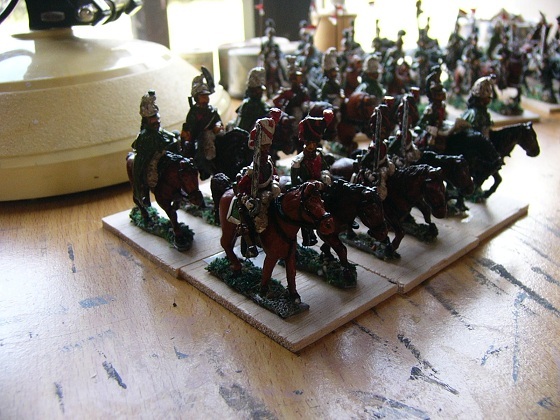 I have decided to base all heavy cavalry on this size base, and for light cavalry the bases are 50x50mm. 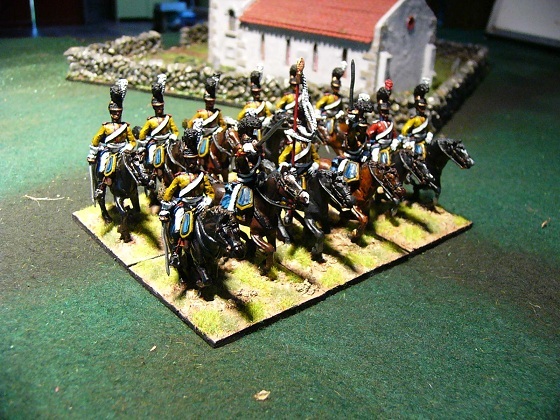 If the Connoisseur Range had one flaw it was the lack of trumpeters and standard bearer figures in the cavalry ranges. I understand that Peter Gilder consciously made the decision not to make them as a matter of economics. He would sell one or two of such figures for every dozen or so of the trooper models. Bearing that in mind, the trumpeter and standard bearer are just trooper models converted. In the case of the trumpeter it is paint only and he must have dropped his trumpet. In an earlier post I said that I wouldn’t even attempt the monograms on the pistol holsters or saddle cloths. As a great philosopher once said A man has to know his limitations. 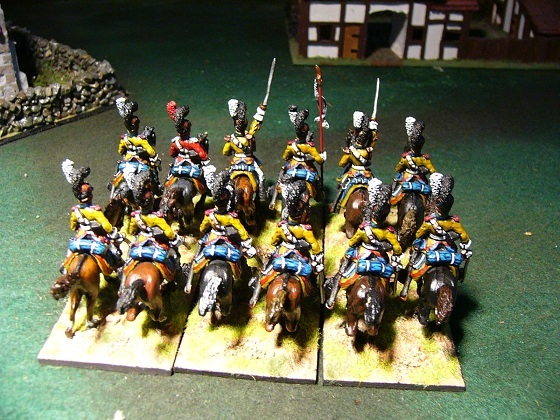 The Zastrow Cuirassiers are next on the Heavy Cavalry to-do list. Just waiting on an order from Bircorne to arrive that includes a solitary Garde du Corps trooper who will become a trumpeter for the Zastrows. Meanwhile, the re-basing of models painted over twenty years ago in the 80s continues. 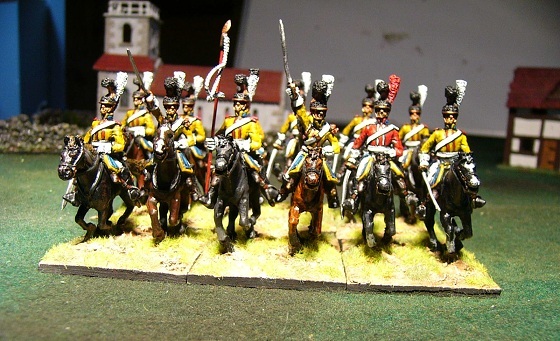 Next – A regiment of Hinchliffe and Foremost Dragoons. Previous PostRural Life: Homekill.Next Post15mm WWII – Stuart Recce Tanks, Kangaroos and Staghounds. Grat painting on some great sculpts. Thank you for sharing. Gilders heavy Saxon cavalry are some of the best looking figures that I have ever seen and they still look good today. You might be able to convert an Elite Miniatures French cuirassier trumpeter into a Saxon trumpeter. Thanks for that. I was just going to leave it as a paint conversion. I have the Leib Kuirassier regiment to do as well – and am using a Guard du Corps trooper as trumpeter for that regiment as well. I agree with you that the Saxon heavy cavalry are great figures. I was thinking of getting Eureka versions but in the end decided that these old school models were just nicer, if not quite as detailed.